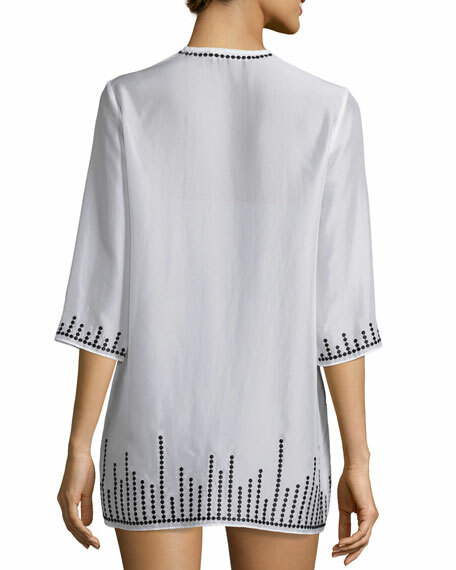 Marie France Van Damme beach coverup tunic with contrast baby dot embroidery. For in-store inquiries, use sku #2011641. Exclusively ours. Chiara Boni La Petite Robe "Bryce" sheer coverup in floral-print. Solid neck, cuffs, and hem. V neckline. Three-quarter sleeves. Relaxed fit. Slipover style. Silk/nylon/spandex. Made in Italy. Emilio Pucci printed kaftan. Deep V neckline. Three-quarter sleeves. Self-tie belt. Easy fit. Maxi length. Slipover style. Cotton/silk. Made in Italy. 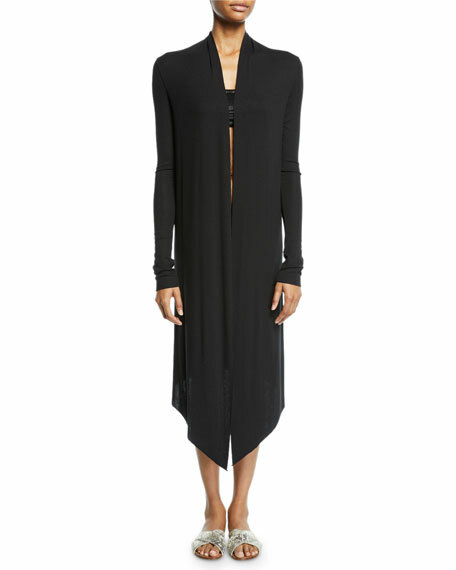 Marie France van Damme coverup cardigan in soft, stretchy silk-modal blend. Shawl collar; open front. Long sleeves. Slim silhouette. Handkerchief hem. Modal/silk/spandex. Imported. Marie France Van Damme "Rafia" two-piece bikini swimsuit set in textured microfiber. Straight bandeau neckline. Fastens at back. Includes matching swim bottoms. Fold-over waistband. Moderate seat coverage. Nylon/spandex. Made in Italy.